The 2018 roadside survey for pheasants showed a 19 percent increase in the overall pheasant index from 2017. While the index is similar to the 10-year average, it is still 52 percent below the long-term average. 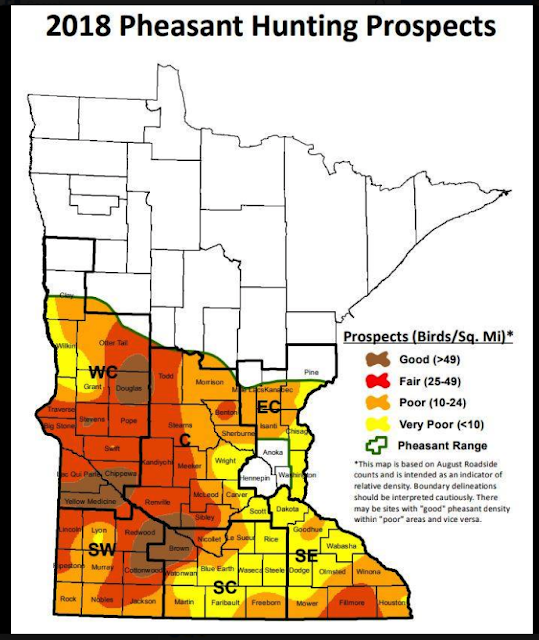 Weather and habitat are the two main factors that drive Minnesota’s pheasant population trends. Weather causes annual fluctuations in pheasant numbers. In the south-central region of the pheasant range, late-season snowstorms and heavy rain this past spring and summer has been tough for pheasants. Habitat can help mitigate the impacts of weather and the availability of quality nesting habitat is more important for long-term pheasant population trends. Conservation Reserve Program (CRP) acres in particular play a large role in providing habitat for pheasants in Minnesota. The program, covered under the federal Farm Bill, pays farmers to remove environmentally-sensitive land from agricultural production and restore vegetation that will reduce soil erosion, improve water quality, and provide habitat for wildlife and pollinators. Minnesota peaked in nesting habitat acres, particularly CRP acres, in 2007 but has declined since then. Minnesota added about 82,500 habitat acres in the past year, many of which were CRP acres; however, nearly 297,000 acres of CRP may be lost within the next two years due to contracts that are set to expire. The DNR’s August roadside survey for pheasants showed a 19 percent increase in the overall pheasant index from 2017. This year’s statewide pheasant index was 45.5 birds per 100 miles of roads driven. The pheasant index increased in all regions except the south-central region, which decreased by 36 percent from 2017. The highest pheasant counts were in the west-central, southwest and central regions where observers reported 48 to 65 birds per 100 miles driven. Hunters should find the best hunting opportunities in these regions. Minnesota’s 2018 pheasant season is open Saturday, Oct. 13, through Monday, Jan. 1. Winters that linger can impact the start of the breeding season and success of early nests. Heavy rain, particularly at or just after hatching, can impact chick survival. One indication of delayed nesting activity were the ages of broods that observers recorded during the roadside surveys. From brood ages, approximate hatch dates are calculated. The range-wide hatch date in 2018 was nearly a week later than in 2017, and a few days later than the long-term average. Hatch dates in the southwest of June 26 and south-central of June 23 were 20 and eight days later, respectively, than in 2017, and they were one to two weeks later than the 10-year and long-term averages. Another key indicator of annual reproduction is the number of broods observed during roadside surveys. The 2018 statewide brood index increased 28 percent from last year. Regional brood indices increased in every region except the east-central region, where it remained similar to last year, and the south-central region, where it declined by 28 percent compared to last year. Monitoring pheasant population trends is part of the DNR’s annual August roadside wildlife survey, which began in 1955. DNR wildlife managers and conservation officers in the farmland region of Minnesota conduct the survey during the first half of August. This year’s survey consisted of 171 25-mile-long routes, with 151 routes located in the pheasant range. Observers drive each route in early morning and record the number and species of wildlife they see. The data provide an index of relative abundance and are used to monitor annual changes and long-term population trends of pheasants, gray (Hungarian) partridge, eastern cottontail rabbits, white-tailed jackrabbits, mourning doves, and other wildlife. The gray partridge index remained similar to 2017 and was 50 percent below the 10-year average and 93 percent below the long-term average. The mourning dove index decreased 7 percent from 2017 and remained below the 10-year average and long-term averages. The cottontail rabbit index decreased 23 percent from 2017 but was 13 percent above the 10-year average and similar to the long-term average. The white-tailed jackrabbit index was similar to last year and remains historically low. The white-tailed deer index decreased 13 percent from 2017 but was still 19 percent above the 10-year average and 99 percent above the long-term average. During the 2018 pheasant season, the daily bag limit is two roosters through November, and it increases to three roosters on Saturday, Dec. 1. The possession limit is six roosters (increasing to nine roosters on Dec. 1). Shooting hours are 9 a.m. to sunset. Additional details are available at mndnr.gov/hunting/pheasant.